What causes the aggregate demand curve to shift? The determinants of aggregate demand - FreeEconHelp.com, Learning Economics... Solved! Aggregate demand is determined by the Y=C+I+G+NX equation, so consumption expenditures, investment expenditures, government purchases, and net exports will determine the aggregate demand curve. It is tempting to think that a change in one of these variables that will cause the aggregate demand curve to shift. 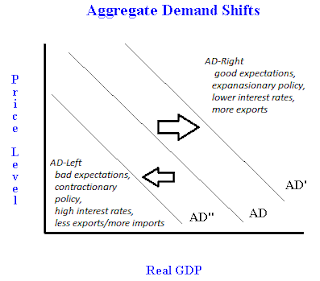 However, we need to remember that an increase in any of these variables as a result of an increase in GDP is already controlled for in the aggregate supply and aggregate demand graph because real GDP is on the X axis. Therefore, to have a shift in our aggregate demand curve, we need to have something fundamentally change in consumption, investment, government, or net exports. 1) A change in expectations for either firms or households. 2) A change in government policy. 3) A change in international variables. A change in consumer confidence, meaning that consumers are more confident/worried and this causes them to buy more/less which shifts the AD curve right/left. A change in wealth or expected future income: the more money an individual has, or expects to get, the more they are likely to spend, thus shifting AD right. The inverse is also true, such as when the stock market crashes, wealth is lost and people tend to spend less shifting AD left. High expectations for economic growth in the future could cause firms to invest now, shifting AD right. Fiscal policy involves changing taxes and government spending. If the government raises taxes, or reduces government spending, then the aggregate demand curve shifts left (contractionary policy). If the government lowers taxes, or increases government spending, we will see the AD shift right (expansionary policy). Monetary policy is the result of the federal reserve (at least in the United States) manipulating interest rates in the economy. If the federal reserve raises interest rates, then we will see aggregate demand decrease or shift left because it has become more expensive to finance investment. Alternatively, if the federal reserve decreases interest rates, we will see investment increase, and aggregate demand will shift right. If the currency in your country becomes stronger (the exchange rate goes up) then your exports become more expensive in other countries, so less are bought. This means exports go down, and thus net exports declines. A decline in exports causes aggregate demand to shift left. If your currency becomes weaker, then countries are able to purchase more of your goods because they are relatively cheaper. This increases exports, and net exports, and therefore shifts aggregate demand right. Also, if GDP is rising faster in your country than others around the world, then the purchase of imports will rise. This reduces net exports and therefore shifts aggregate demand to the left. However, if the rest of the world’s GDP is rising faster, then they will begin purchasing more of your goods, increasing exports for your country. This will shift aggregate demand to the right. Below you will find a video that goes over AD shifts with explanations showing several examples of shifts in the aggregate demand curve. I'd like to point out that this could be more thorough. If the government increases spending, then aggregate demand shifts right, causing an increase in inflation and an increase in interest rates. The demand for US currency increases, causing the currency to appreciate. The appreciation, however, will cause exports to fall and imports to rise, shifting the AD curve back slightly. Who can do my programming homework because live programming help is available whenever you need it, day or night.